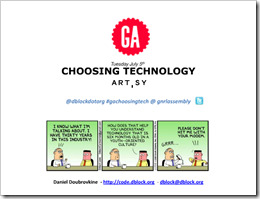 Slides from today’s “Choosing Technology” that I gave at @gnrlassembly are here. Thank you all for coming! Slides from 'Choosing Technology' was published on July 05, 2011 . See a typo?